The movie, “Chef” shows what life is like when you run a food truck. We just ate up the movie (read our review) but couldn’t stop thinking about Denver’s food truck scene as we watched. Denver’s scene is growing and thriving. What’s it really like to run a food truck in Denver? We asked two popular food truck purveyors and got some interesting answers. 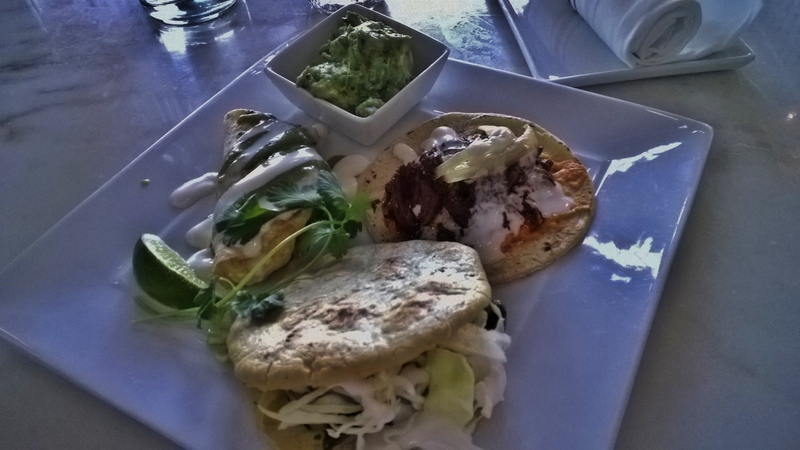 From Comida Cantina at The Source – Rajas y Crema Gordita, The Sirloin Situation and Stella’s Pork Carnitas tacos. Rayme Rossello wanted to be an actress in New York. In the grand tradition of actors, she became a great waitress while attending theater school. One day, Rosello fell in love with dining in a way that made her want to change her career goals. “I was always front of the house, never in the kitchen. I loved serving. I loved what it was like to be served when it was gracious and great,” she says. After moving to Colorado, Rossello worked for several restaurants and was part owner in a couple as well. “Then I decided I wanted to get uncomfortable doing something I hadn’t done before,” she says, and signed up for pastry school. She came out of the five week program absolutely sure she never wanted to be a pastry chef. “And probably never bake another cake if I didn’t have to,” she adds. In 2010, she decided to start the food truck, which she named Tina. Rossello’s family is southern, but her mother lived in Mexico for a decade. “Those were flavors I loved, so I blended the two together and, with a couple of friends who literally jumped on board, like in the movie, developed the recipes in my head and brought them to life.” They kept the menu small and simple. “It’s Mexican street food, everyday snacks,” she explains. Rossello’s items range from $3-$8. She uses local food whenever possible and makes everything from scratch except for the tortillas. Favorite items are the Sirloin Situation Taco and the Slow Cooked Mushroom Gordita. The EBS (Emergency Bacon System) hamburger with freshly ground chuck and bacon burger, topped with green chilies and aged white cheddar. Under David Levine’s name on his business card, it says “Burgermeister.” Hamburgers are his favorite food. 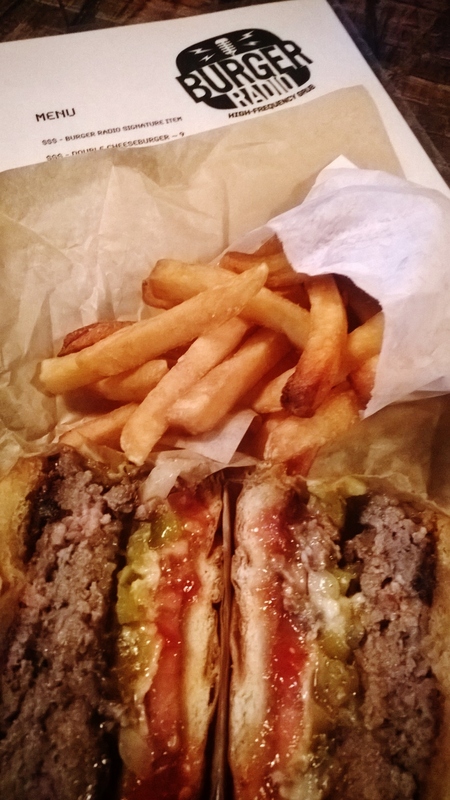 Levine prefers more bistro style hamburgers with something unique and different about them. With some experience working in restaurants when he was younger, but no formal culinary training (“except for getting my chops up for the truck”), Levine decided to open his Burger Radio food truck to bring his style of burger to the Denver market. That was five years ago. Burger Radio has a “burger lab” theme, complete with antennae on top, inspired by Levine’s love of comic book and super hero characters (think robots and aliens trying to take over the world). “We think of ourselves as ‘burger slinging vigilantes’.” Menu items include high-frequency-themed items such as The Marconi, Pirate Radio and the EBS – Emergency Bacon System. Despite hours that run 5am to midnight six days a week, Levine says “It’s my favorite thing I’ve ever done.” He and his team jokingly equate working in the food truck with working in a submarine. “It can get very hot in there but after working throughout last winter (except for a couple of weeks off), I don’t mind.” These days, Burger Radio can mostly be found outside of breweries which rarely have kitchens. To Levine, it’s a natural pairing for his burgers. Read more news and reviews of restaurants, movies, theater and travel on the In Good Taste Denver blog.